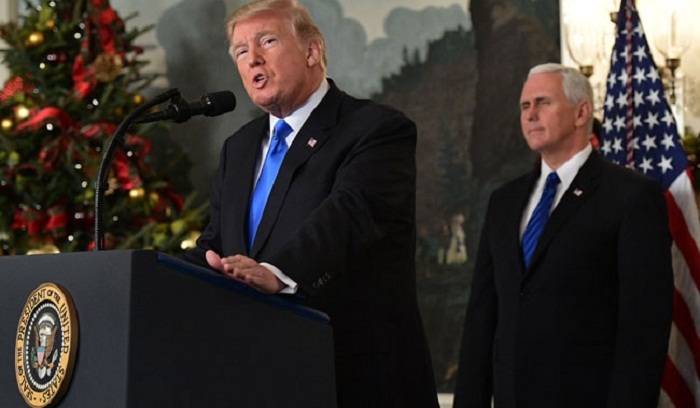 President Donald Trump recognised the disputed city of Jerusalem as Israel's capital Wednesday, a historic decision that overturns decades of US policy and risks triggering a fresh spasm of violence in the Middle East. "Acknowledging this as a fact is a necessary condition for achieving peace," added the US leader, declaring: "It is time to officially recognise Jerusalem as the capital of Israel." "This is nothing more or less than recognition of reality. It is also the right thing to do." Trump's announcement plunges the United States into a decades-long dispute over a city considered holy by Jews, Muslims and Christians, and flies in the face of warnings from US allies and leaders across the Middle East. The US president also kicked off the process of moving the American embassy from Tel Aviv to Jerusalem, making good on a campaign promise dear to evangelical Christian and right-wing Jewish voters -- as well as donors. Trump said his decision marked the start of a "new approach" to solving the thorny conflict between Israel and the Palestinians -- as he insisted Washington remained intent on pursuing a peace deal for the region. "Peace is never beyond the grasp of those willing to reach it," said the US leader, who declared that "the United States would support a two-state solution if agreed to by both sides." "This decision is not intended in any way to reflect a departure from our strong commitment to facilitate a lasting peace," Trump said, as he announced that Vice President Mike Pence would travel to the region in the coming days. "So today we call for calm, for moderation, and for the voices of tolerance to prevail over the purveyors of hate."